Forza Horizon 4 is here, its the game I have been waiting for all year and to say I have high hopes would be a total understatement. After seeing the initial preview video I have been like a kid looking forward to Christmas. I know it is going to be good, but will it live up to my expectations…. 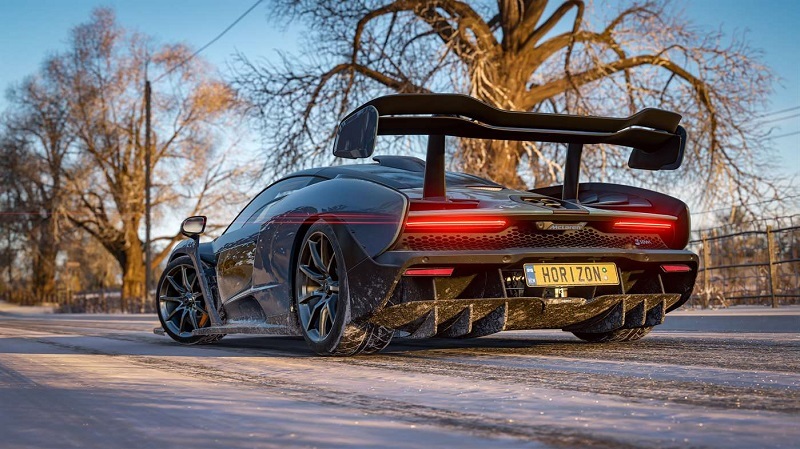 The game loads up and you see a Mclaren Senna rolling through the beautiful British landscape that the game is set in. To be honest, living in England I am not sure that the UK is this stunning, but that is by the by, the game is. The music tinkles in the background as the camera pans around your car. It is one of those moments that makes the hairs on the back of your neck stand on end and you know you are in for something special. The introductory event also sees you start racing in the McLaren Senna. As this event progresses you transition from season to season. Once again the team at Playground Games have managed to squeeze that little bit more graphical juice out of the Xbox One and even more so in 4K on the Xbox One X. The game runs at a smooth 30 FPS, and on the X, it carries the option to drop the resolution to 1080P while boosting it to 60 FPS. It is all personal preference but I preferred the more detailed 4K setting. The lighting, the shadows and the detail on the textures really are next level and this is the best looking console game I have come across to date, it really is jaw-dropping. Lots of hype has been made around the seasons feature incorporated into the game (I did joke initially this would quite literally need a season pass when it was announced). 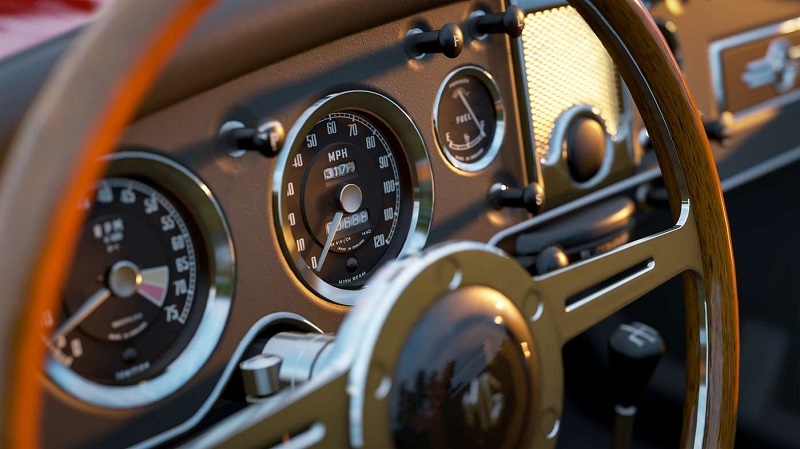 Its a great addition to the game as it alters the environments around you and how the car controls, adding to the variety and longevity to the game. As you progress up to the quicker classes of car, the environment whips past you at an amazing pace with no drop in performance. Just enjoy the scenery when in those lower class cars whilst you can still clearly see it. The transition from area to area is not as stark as the Australian setting in the 3rd game, it feels more subtle and natural. It really does flow well from area to area. Even though it covers quite distinct regions of British scenery such as the Cotswolds, the Lake District and the historic City of Edinburgh, for some it may seem slightly disappointing that the map is around the same size as in the last outing. It is massive nonetheless with plenty of areas to explore and it is a refreshing change to see developers use other areas of the UK other than the usual grimy London setting. It takes around 4–5 hours of gameplay to open up the main game as you earn “Influence” in order to qualify and unlock the Horizon events, or as it is now called “Horizon Life”. Which is very apt as I can see this taking over my life. 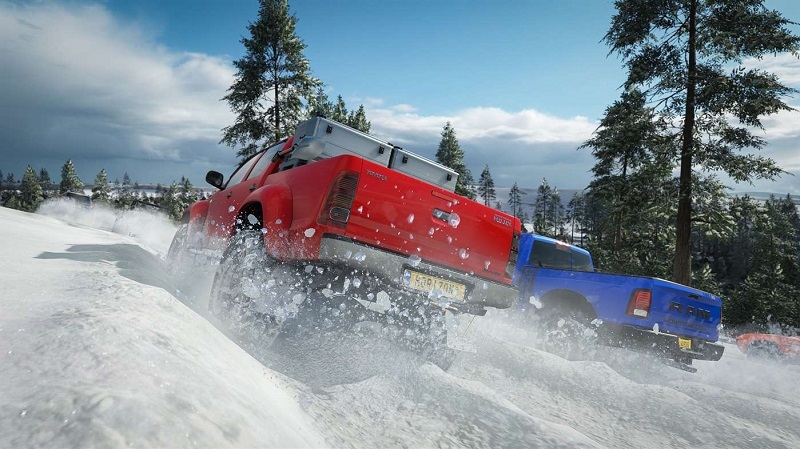 The races and events are familiar to anyone who has played the previous games in series – straight A to B racing, laps, championships, street racing and off-road. For the events, danger jumps, drift challenges, barn finds for those rare cars and speed cameras are still all here and are enjoyable as they ever were. Blueprints are available to make your own events and to share with your friends. There is a new Horizon story to participate in, this seems to have replaced the old “bucket list” challenges, and it does a more than adequate job. Onto the showcase events. We have all seen the Halo-themed showcase, and if you have an Xbox, who doesn’t like a bit of Halo? This event felt more Halo-y than the Master Chief on Halo, playing Halo, whilst whistling the Beyonce song. This is bound to go down a treat with the fans. The others are great fun and equally as crazy, you race a hovercraft and keeping with the English theme you even have a race against the Flying Scotsman. You finish off the section from the introductory race where you go up against motorcycles and even a Delta Wing Jet that makes the screen shudder about, it is a great effect that’s in sync with the pad rumbling. A new feature in the game is the ability to customise your avatar. If I am honest, for me this is not a welcomed addition as I think it is a bit of an unnecessary distraction from what the game is actually about. 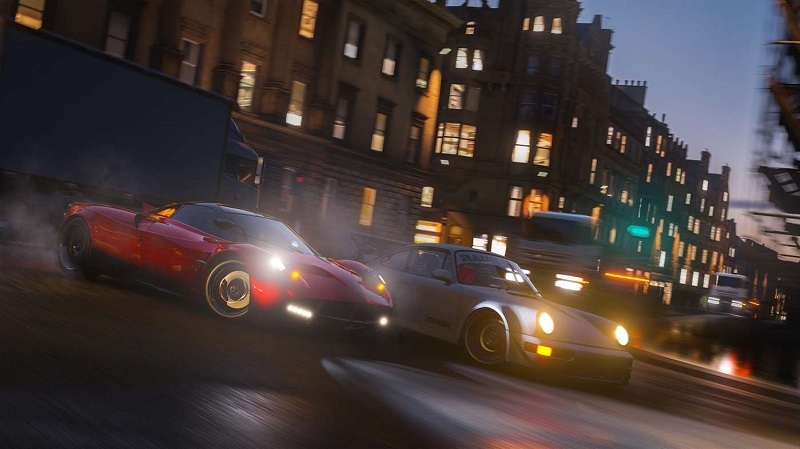 Some may really enjoy it and the developer has put in a few bonuses for those who have played any previous Forza titles. The addition of the avatars is a minor gripe but if this is the only negative I can find that can only be a good indicator of the exceptionally high-quality level put into this game. Back to the pros, the customisation does not stop with the avatars, the 450 cars in the game are still all tuneable as before and now have optional body kits. Additionally, the ability to add spacers on the wheels making the cars look more aggressive is now an option. For the artistic amongst you, the livery is back too, and it looks like Banksy has a part-time job working there. The radio stations are also back, I found Horizon Bass Arena or Block Party my most listened to channels. Block Party is hosted by Radio 1’s very own Mista Jam and he pushes out those Hip-Hop beats, whether it is something newer like Kendrick Lamar or classics like Eric B and Rakim’s “Don’t sweat the technique” or even some “Rapper’s Delight” from the Sugarhill Gang. You can find drum and bass on Hospital Radio, or Timeless for those classical tunes to chill to, or Pulse for some more Pop like music and if bands are more your thing then XS is the choice for you. There are subtle changes in the open world you share. Previously this was dominated by avatars, now real people inhabit the map. You can interact with them but they only appear as ghosts, which kills off the chance of any griefers and if you do not want to be socially active you don’t have to be. It does feel like there has been a bit more of a step towards making some of the online features team-based though. This makes it a bit more accessible to newcomers in certain game modes. 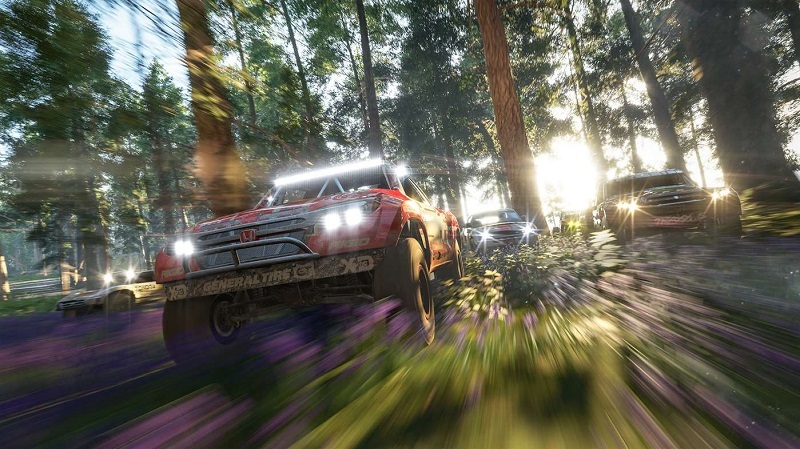 Thankfully many of the previous online modes return – straight racing, a tag mode, and a cross-country type race. The Team Adventure mode makes the game more of a co-operative affair rather the previous P vs P modes or Team vs Team, which is a nice option have to be able to enjoy further with friends. If you cannot tell, I really love this game. As I mentioned on my Horizon 3 review, I am not big on racing games so for me to love it as much as I do it really shows that Horizon is not just a great racing game, but an exceptional series of games. Whilst this latest edition does not reinvent the wheel, as I thought it was the perfect circle anyway, it really is hard to see how this game and series can get any better. I have no regrets in paying out for the Ultimate edition. It is just about as fun as you can have with your clothes on, and a couple times I was tempted to take them off! One final note, the steelbook for the Ulitmate Edition is beautiful!